The world on the other side of the rift: Kelewan, a land seething with political intrigue and deadly conspiracies. 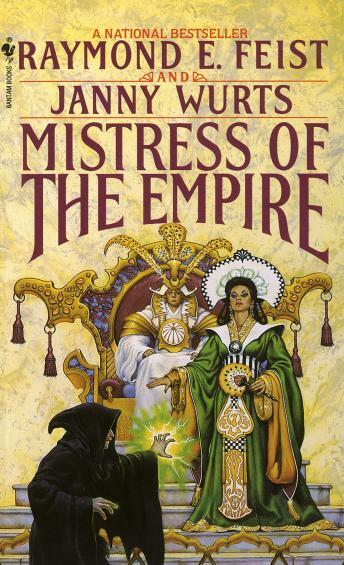 Following the opulent panoply of Daughter Of The Empire and the dazzling pageantry of Servant Of The Empire comes the resounding conclusion to the Empire trilogy. Besieged by spies and rival houses, stalked by a secret and merciless brotherhood of assassins, the brilliant Lady Mara of the Acoma faces the most deadly challenge she has ever known. The fearsome Black Robes see Mara as the ultimate threat to their ancient power. In search of allies who will join her against them, Mara must travel beyond civilization's borders and even into the hives of the alien cho-ja. As those near and dear to her fall victim to many enemies, Mara cries out for vengeance. Drawing on all of her courage and guile she prepares to fight her greatest battle of all--for her life, her home, and the Empire itself.